but many swallows suggest that summer has arrived!! Last Sunday the familiar shape passed over the road as we drove down to Portbail; but it was such a fleeting glimpse that it was not sure. However Tuesday was a very definite sighting of two over the bridge at Portbail, and then yesterday definite sightings of groups over the roads between Portbail and Surtainville. It’s taken us so long to report these sightings because for the past week, as you probably can guess, we’ve been in Portbail. We’ve travelled in early morning, and not returned till late evening. 13hour days working with a group of French schoolchildren from just north of Paris on an immersion English course, including a daytrip to Jersey!! We’re exhausted, but just about ready for the season as it begins. So summer is officially here, and all signs are that this is going to be a good one. A little cool today, Easter Sunday, but it’s only early April yet. Time to look forward to those long lazy days of summer holidays on the beach at Surtainville. Easter might be the earliest it can possibly be this year; but is Spring going to be early too? We’ve just had an absolutely glorious weekend; in fact last week wasn’t bad. Clear blue skies, hour upon hour of sunshine, and warm with it. Daytime temperatures are around 12 or 13. Glorious sunsets – We’re basking in the red glow of tonights as I write this – giving way to clear night skies with the stars shining brightly – no light pollution here; the moon and stars are bright and clear in the sky. Payback is in the nightly temperatures dipping to just above freezing, but that again gives clear frosty mornings. Everything is bursting in to life with this unaccustomed warmth. 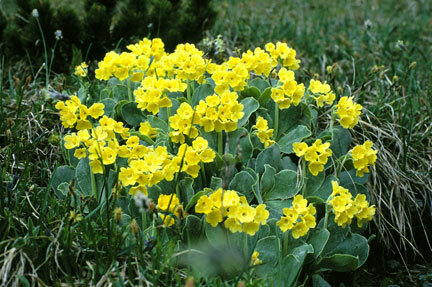 The primulas cover the banks at the roadside, the grass is growing, catkins have appeared, and white blossom. Yesterday afternoon doing a little work in the garden we were surprised by bees buzzing round the heather, and midges dancing in the sunshine. If you want to enjoy this early Easter and warm spring in Manche, why not contact us for details of Spring special offers? In the meantime we’re off to enjoy a glass of kir as we watch the sunset.